The pressure a bending machine applies radially (in the X-axis) to a tube at the point of bend in order to hold the tube against the bend die during the bending process. 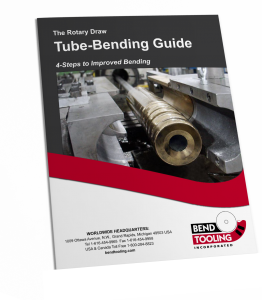 Direct pressure, unlike assist or boost pressures, is a fundamental element of the bending process, because without direct it, the back tangent of the tube would swing away from the bend die, thus no bend would be formed. Direct pressure is applied by means of the “pressure die”, which see. Compare assist pressure and boost pressure. Direct pressure should be increased as the rigidity of the tubing material increases. Direct pressure unavoidable causes drag on the tube, which works against the free flow of material at the point of bend. Therefore, no more direct pressure should be applied to the tube than is necessary to prevent it from pulling away from the bend die during the bending process. Excessive direct pressure has the effect of clamping on the back tangent of the tube, just as the clamp die clamps on the forward tangent. Thus the tubing material excessively stretches and flattens between these two points of die contact along the outside radius of the bend.